TaaRay.com: 99 Interesting Facts about Honey Bee ! A queen bee can lay up to 2000 eggs a day. There are 3 kinds of bees in a hive: One queen, up to 1,500 male (Drones), and all the rest are female workers. Drones do not sting! Only the females do. 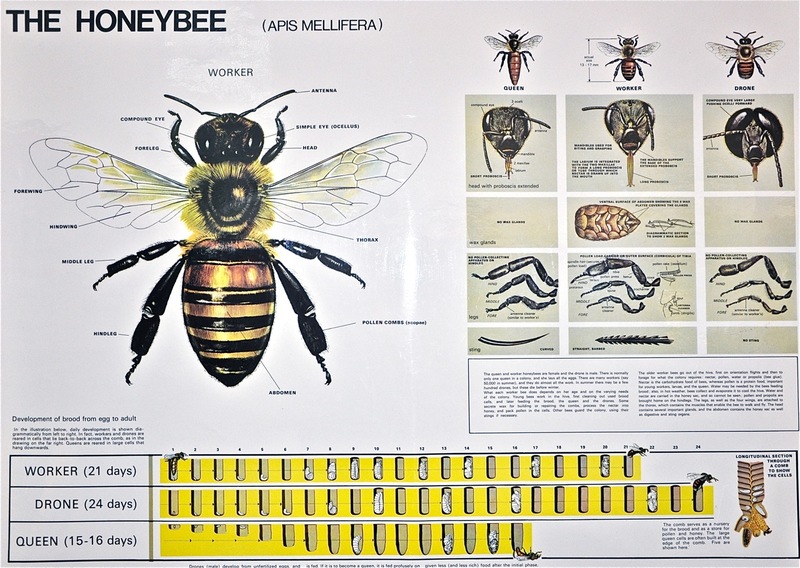 There are 52 kinds of bees. 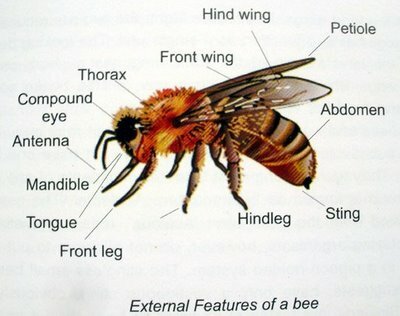 There are 16 kinds of honey bees. There can only be one queen bee per hive, if there is more than one they will fight to the death or swarm. The queen bee can live to 3-5 years. The worker bees only live 6 weeks in the summer, but will slow down in the winter and will live 8 weeks or longer. The workers do a dance to show direction and duration to where food is located. Honey bees will fly up to 2 miles in any direction for food if they have to. Honey bees will only fly if it 55 degrees or warmer. The temperature in a hive in the middle of winter will be 75 degrees. The temperature in a hive in the middle of summer will be 95 degrees, for brood production. Honey bees stuff pollen in 'baskets' on their legs, and can carry almost half their weight in pollen. Honey bees create wax in little flakes from glands under their abdomens. Honey bees cannot see the color white. That is why it is good to wear white in the summer. That is why bee suits are white. You are more likely to get stung on windy, warm days because wind can push them into your path easily. It takes nearly 48 bees in their life time to actually make 2 table spoons of honey. They are trying to evaporate the excess water out from the nectar they have collected to make honey, which also helps to regulate the hive temperature. Honey can last indefinitely if stored correctly; at less than 18.5% moisture content. Examples of honey were found in the Egyptian tombs. Honey has been used for medicine by the Egyptians as far back as 5000 years! Honey is very good for burns, abrasions, and indigestion. 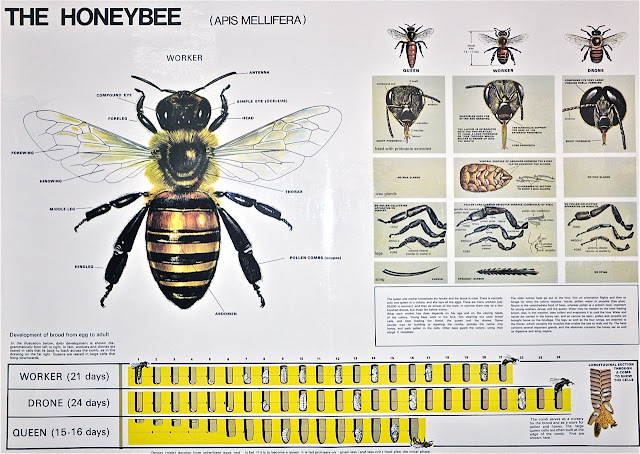 The sting of the honey bee is used for arthritis; which is called Apitherapy. There are over 300 varieties of honey, because there are over 300 kinds of flowers. Darker honey has higher mineral content and antioxidant potential. Honey should not be fed to babies under the age of 1 year due to the botulin toxin. Honey is an effective antimicrobial agent. Bees need to provide 70,000 loads of nectar, and travel 50,000 miles to produce a single pound of honey. Bee colonies have been known to produce up to 300 pounds of honey in a single season. Is a “perfect food,” which contains: large amounts of vitamins, minerals. Being particularly rich in vitamins B & C as well as vitamin A, beta-carotene, D, E, and K.
Has all of the B-complex that are needed in the system for digestion and metabolism of sugar. Also is rich in minerals such as calcium, phosphorus, magnesium, potassium, silicon, iron potassium, iodine, manganese etc. Varieties can contain as much as 300 milligrams of vitamin C per 100 grams of honey. Has a PH of 3.4 – 3.6, and can kill many kinds of bacteria it comes in contact with. Has been proven to exhibit significant inhibitory effects on the bacteria that cause gastric ulcers. Has biblical references such as “Land of milk and Honey”, “Honeycomb” and is also mentioned in other religious texts such as the Koran. Contains valuable nutrients that are easily digested by our bodies. Has the potential to top 300 varieties. In the raw form has a more therapeutic value. That there are 75 substances found in honey. Is highest composition of Glucose, and fructose? Has monosaccharide (simple sugars), which are more easily assimilated than any other forms. Does contain proteins, carbohydrates, and organic acids, along with antimicrobial compounds. Composed of 38% fructose, 31% glucose, 1% sucrose, and 9% additional sugars. Has 63 calories of good carbohydrates and energy. Have ample supplies of live enzymes, which are required for the proper functioning of all body systems. In fact it is one of the foods with the highest content of enzymes. Have very good antioxidant properties. Characteristic properties provide: antibiotic, antiviral, anti-inflammatory, anti-carcinogenic, expectorant, anti-allergic, laxative, anti-anemic. Targets body systems such as: Intestinal, Integumentary, skeletal. In a spoonful, has glycogen and can pass into the bloodstream in 10 minutes to produce quick energy. Honey Glucose boosts absorption of essential minerals such as zinc, calcium and magnesium. Help you to loose weight when taken 30 minutes before bed-time. Helps you to sleep more sound. Of the over 900 different remedies used in ancient Egypt, more than 500 were honey-based. Has been used as a treatment for open wounds, including war wounds. Knights of the Crusade used honey as wound dressings and found it was a very effective treatment. Ancient Egyptians and Greeks used honey to embalm their dead. Bee pollen has been 'medicinally used as far back as 2ns B.C. Honeybees pollinate 80 percent of green growing plants. Roman legionaries carried pollen cakes with them on long marches as the only source of food. Emperor Charlemagne requested honey and pollen in the form of tax payments. Pollen contains concentrations of almost every known nutrient. Niacinamide, B-5 (PantotheIlic acid), B-6, B-12 Also contains Vitamin CAB Carotenoids, and Folic acid. " 20% of Bee Pollen is composed of amino acids, and proteins. Has an undetermined amount of HGH (Human Growth Hormone ) Gonadatropin. Minerals found in Bee Pollen include: Magnesium, Calcium, Copper, Iron, Silica, Phosphorus, Sulphur, Chlorine, and Manganese. Essential fatty acids are also found in Bee Pollen. All body systems benefit from Bee Pollen, with special emphasis on reproductive, immune, and nervous systems. Bee Pollen has no restrictions and is considered a food rather than an herb or vitamin. Bee Pollen contains various properties, which can speed healing, and even protect cells, against free radical damage. The Honey Bee will only select the pollens which are rich in nitrogenous matter (amino acids), and leave poor quality behind. Not only does Bee Pollen contain a complete complement of nutrients, but its glucoside content helps transport those nutrients into the bloodstream for use. Scientific studies have found that a person can live indefinitely on Bee pollen and water . Bee pollen contains virtually all the essential nutrients which are necessary to sustain life. It is viewed as a perfect food, and a complement to any diet especially to those whose diets are unbalanced of deficient. 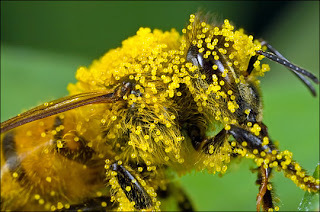 Bee Pollen can not be reproduced in the laboratory. Its chemical make-up is so complex , that synthesizing it artificially has eluded even the best efforts in technology .